"Westcliff" redirects here. For other uses, see Westcliff (disambiguation). Westcliff-on-Sea is a suburb of Southend-on-Sea, a seaside resort and unitary authority in Essex in south-east England. 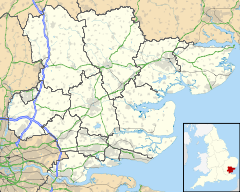 It is on the north shore of the lower Thames Estuary, about 34 miles (55 km) east of London. The cliffs formed by erosion of the local quaternary geology give views over the Thames Estuary towards the Kent coastline to the south. The coastline has been transformed into sandy beaches through the use of groynes and imported sand. The estuary at this point has extensive mud flats. At low tide, the water typically retreats some 600 m from the beach, leaving the mud flats exposed. The London, Tilbury and Southend Railway line arrived in the 1880s, connecting the town with London and shortening travel time to and from that city. Westcliff railway station in Station Road is now managed by c2c. An area of Westcliff bordering Southend town centre has been classified as a conservation area, including Prittlewell Square gardens and the Grade II listed building, Our Lady Help of Christians and St Helen's Church. The main shopping area in Westcliff-on-Sea is Hamlet Court Road, where the department store Havens, established in 1901, remained the anchor store until its closure in 2017. Hamlet Court Road took its name from a manor house called the Hamlet Court, which stood on land now occupied by Pavarotti's restaurant and adjoining shops, facing towards the sea with sweeping gardens down to the rail line. The road later developed into a strong independent retail area and quickly became famous outside the area as the Bond Street of Essex. There were many haberdashers and specialist shops, and it was not too unusual to see chauffeurs waiting for their employers to emerge from the shops. The economic recessions of the 1980s and 1990s saw the area decline. The road underwent a £1 million regeneration in the early 2000s and a further regeneration in 2010. The street is now known for a large number of restaurants. The two main theatres in Westcliff are the Cliffs Pavilion, which overlooks the seafront, and the Palace Theatre. Westcliff-on-Sea is also home to the Thames Estuary Yacht Club and the Westcliff Casino. ^ Ordnance Survey: Landranger map sheet 178 Thames Estuary (Rochester & Southend-on-Sea) (Map). Ordnance Survey. 2014. ISBN 9780319229675. ^ "Hamlet Court Road street party filmed for BBC show - Evening Echo p.6 June 2013". Retrieved 19 December 2016. ^ "London's Turning - The making of Thames Gateway - Edited by Philip Cohen & Michael J. Rustin page 219". Retrieved 19 December 2016. ^ "Southend Theatres". www.southendtheatres.org.uk. Retrieved 11 April 2016.